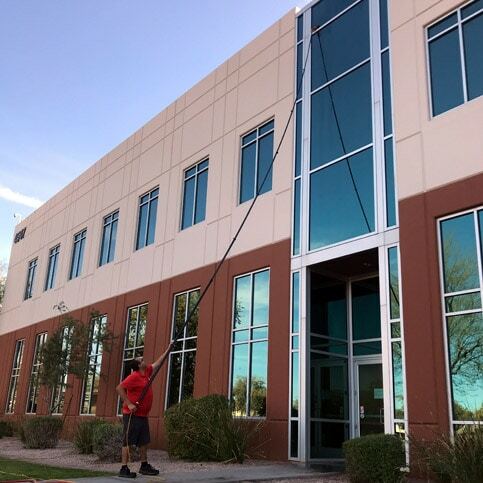 Professional commercial window cleaning services from a background-checked and experienced team. It’s all backed by ClearPro’s insurance and our 100% guarantee! We offer customizable window cleaning plans for every type of window and every type of business. We have a business insurance policy with necessary riders for the protection of your business. Background-checked and trusted technicians in marked vehicles have the right equipment for the job. When you manage a business, there’s a lot to remember. Having to call for commercial window cleaning shouldn’t be one of them. We offer customizable service plans. Choose from the list of services we offer. Then, choose the frequency of those services. If you’re not completely satisfied with our work, let us know. We’ll make things right. ClearPro offers free quotes on our commercial services. Fill out our online form or give our team a call. We’ll meet with you at your place of business to learn more about your company and look at your windows. From there, we can then recommend what kind of service and frequency you’ll need. This is a free, no-obligation quote. We’d be honored to be your window cleaning company. Our team can clean buildings up to 5 stories. We use a state-of-the-art pure water-fed pole to clean your windows. This water is put through a 5-stage purification process before being applied to your windows. Doing so removes dissolved solids and calcium from tap water that causes water damage to commercial windows. 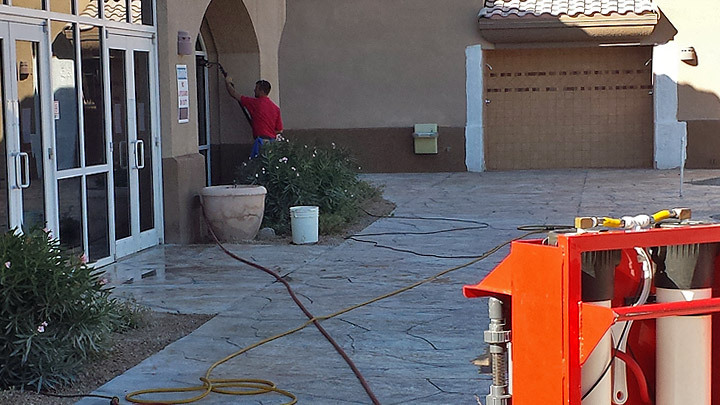 Pure water is ideal for removing the dirt and dust we encounter here in Phoenix. The system we use also helps us avoid the overuse of ladders, scaffolds, or hydraulic lifts, and allows our team to focus on getting the best streak-free finish for your windows. Safety is key to everything we do. One of the reasons we only hire journeyman-level techs to work on your windows is because we want our team to know what they’re doing, and be able to make good decisions. Our water pole system also allows us to avoid major ladder, scaffold, or lift work, which makes everything much safer for both your employees and ours. Each project starts with a safety check to make sure all the technicians on our team know the project outline and what is expected of them. Here’s what we offer: sparkling clean windows. Using our pure water system and other tools available to us, we provide a streak-free finish on your glass. No spots, no lint, no mess. We clean all types of commercial windows. Whether you have plate glass several stories up or silled windows at the ground level, we have the means and experience to leave your building looking stunning. 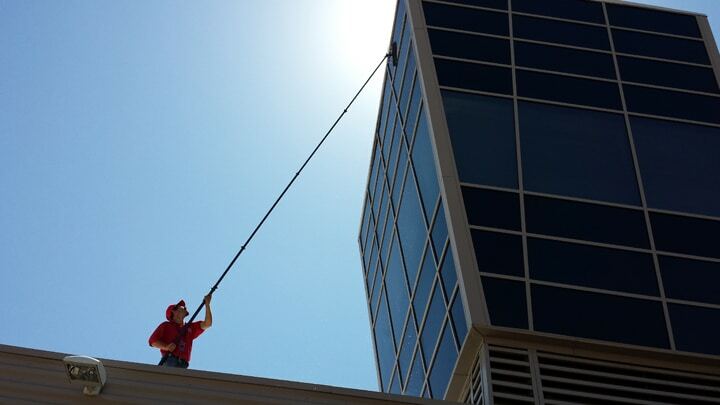 Every commercial window cleaning project ends with a quality check from our technician. We go over all of our cleaning to make sure there are no spots or streaks. If we had to move anything to clean your windows, this check will include making sure everything is back where it started and undamaged. Our own quality check is backed up by yours. We offer a 100% satisfaction guarantee. Let us know if there’s something we missed, and we’ll come back and make it right. Should one of our employees be injured on the job while working in or around your business, this policy covers their injuries and protects your business. Our $2M in general liability coverage protects your business and ours. Our coverage includes two riders protecting your windows and property from damage during our cleaning. All of our employees are background-checked, journeyman-level window cleaners who have been in this business for years. This bond is a precaution protecting your business from any property theft. Our business has been serving the northeast Valley since 1994. We provide both residential and commercial window cleaning services in Scottsdale, North Phoenix, Carefree, and surrounding areas. We’d like to be your business’ window cleaners. Click the link below to learn more about us, or to get started on your free estimate. We only hire journeyman-level techs. These aren’t just people off-the-street. They’ve been in the business for years and have worked with many buildings just like yours. We background-check every single person we hire to make sure they’re ready to work in, and around, your business. Click the link below to get to know our window washers!